Before deciding to lower a victim, be sure that's exactly what you want to do. Once started, it's very hard to reverse. It can be especially tricky with a small party, in which there are not enough people to provide an independent belay or help out if complications arise. If you go ahead with lowering, watch that the rope doesn't dislodge dirt or rocks. Downclimbing: A person wjth slight injuries can climb down under tension from a tight belay, assisted by a companion who helps with placement of hands and feet. On snow or ice, large platform steps can be prepared. Lowering in the seat harness: You may be able to lower the injured climber by the seat har ness if neither downelimbing nor rappelling is possible. The victim must have no serious leg or upper-body injuries. 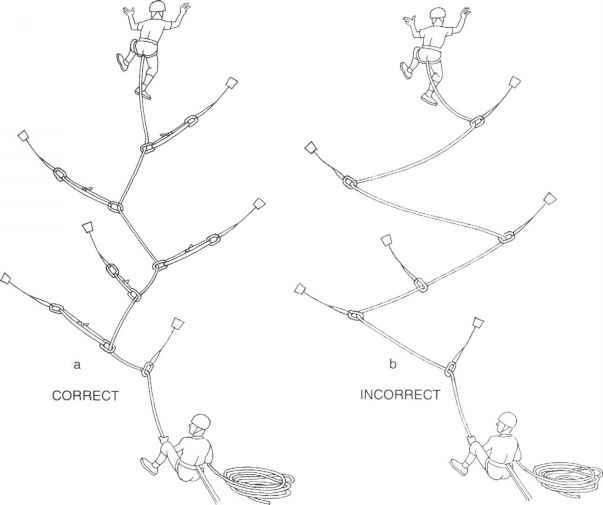 Use a rope with a lowering device (described in the next section) to lower the victim, who uses hands and feet against the terrain to help guide the way down. 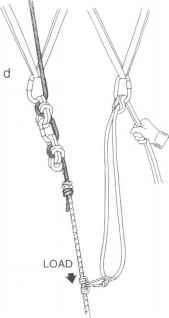 The person will stay upright more easily by wearing a chest harness with the rescue rope going up through a carabiner at the harness. The injured person should be on an independent belay. Back carry: This is a good technique if the victim has a minor but disabling lower body injury or is uneasy about rappelling or being lowered. Keep in mind that the rescuer must be strong enough to take the weight of the other person and still be able to maneuver. This will be especially difficult on low-angle rock. Connected like this to the victim, the rescuer will find it almost impossible to give first aid if medical problems arise. Do not use the back carry in cases that involve back or neck injuries, suspected internal injuries, serious head injuries, or other conditions requiring constant monitoring. For these, a rigid stretcher must be used. Two common methods of back carry are the coil carry and the nylon-webbing carry. 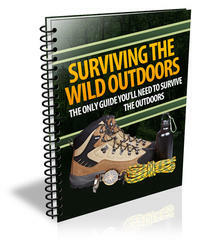 If possible, have the rescuer and victim on an independent belay, regardless of the method. In the coil carry, the rescuer slips half the loops of a coiled rope over one shoulder and half over the other, with the coils looping down the back to form a seat for the injured climber (fig. 17-3). Tie a short piece of webbing around both loops over the rescuer's sternum to keep the coils from slipping off the shoulders. 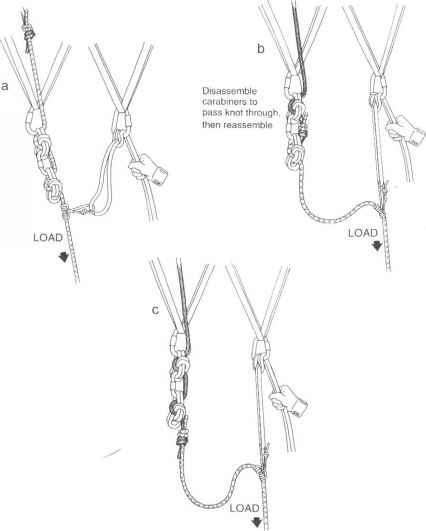 Run a prusik loop from the lowering rope to the injured person's chest harness to take some weight off the rescuer's shoulders and help keep the victim upright. 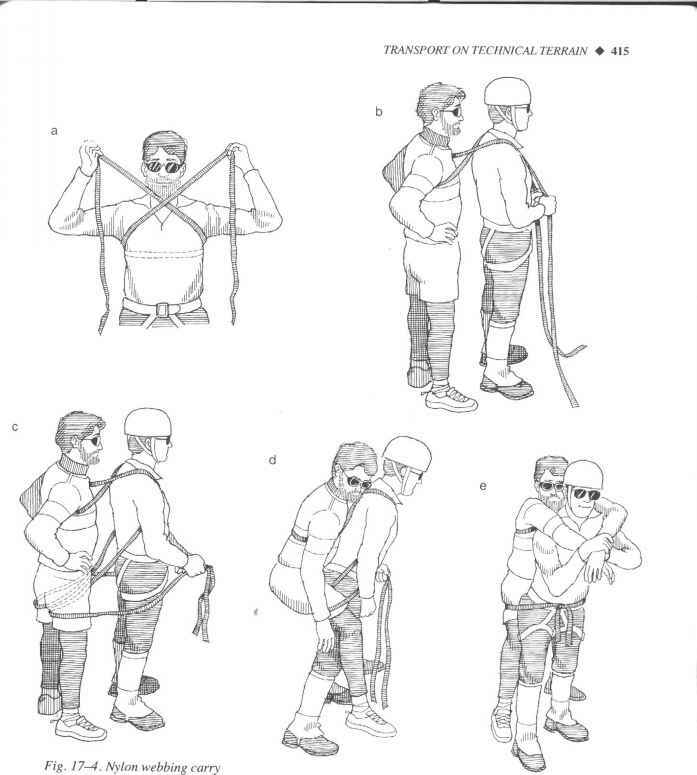 Another method of back carry employs nylon webbing to support and distribute the victim's weight (fig. 17-4). The webbing should be extremely well padded, especially under the victim's thighs, to prevent concentrated pressure that will cause a loss of circulation. 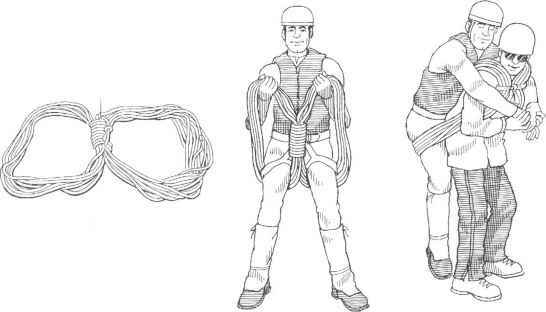 How to belay an injured person down?